The Okavango Delta (or Okavango Swamp), in Botswana, is the world's largest inland delta. It is formed where the Okavango River empties onto a swamp in an endorheic basin in the Kalahari Desert, where most of the water is lost to evaporation and transpiration instead of draining into the sea. Each year approximately 11 cubic kilometres of water irrigate the 15,000 km² area and some flood-waters drain into Lake Ngami. The Moremi Game Reserve, a National Park, spreads across the eastern side of the delta. 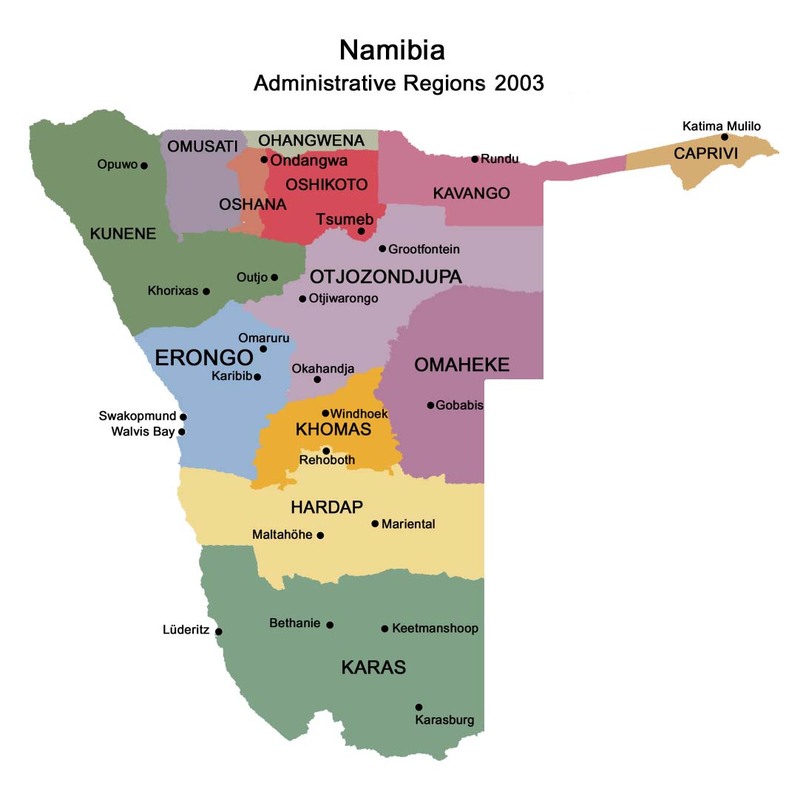 The area was once part of Lake Makgadikgadi, an ancient lake that mostly dried up by the early Holocene. 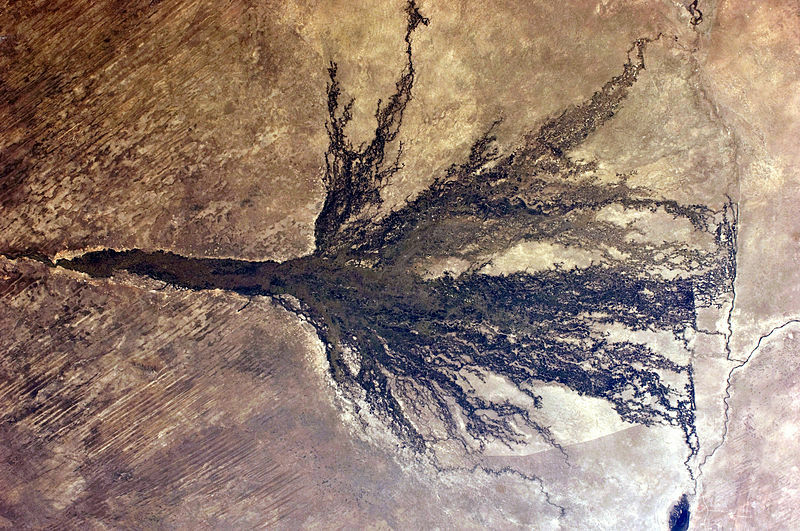 The Okavango Delta is produced by seasonal flooding. 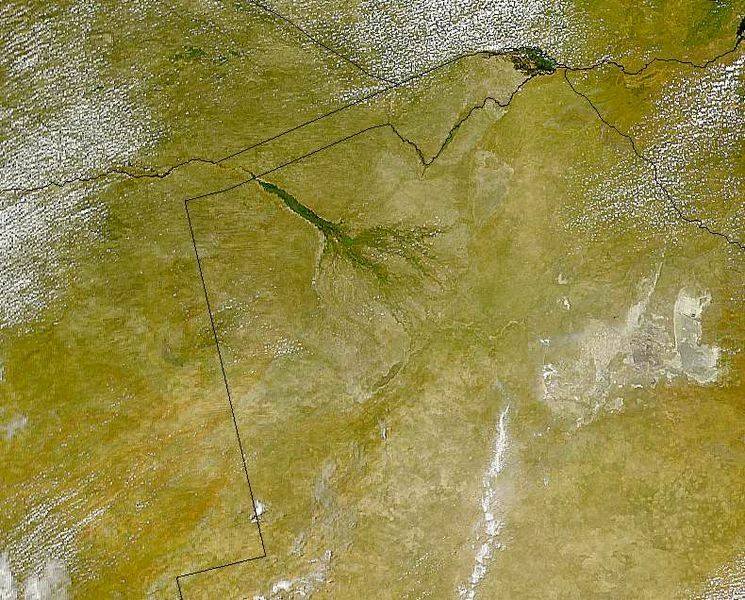 The Okavango river drains the summer (January–February) rainfall from the Angola highlands and the surge flows 1,200 kilometres in approximately one month. The waters then spread over the 250 km by 150 km area of the delta over the next four months (March - June). The high temperature of the delta causes rapid transpiration and evaporation, resulting in a cycle of rising and falling water level that was not fully understood until the early 20th century. The flood peaks between June and August, during Botswana’s dry winter months, when the delta swells to three times its permanent size, attracting animals from kilometres around and creating one of Africa’s greatest concentrations of wildlife. Every year, circa 11 cubic kilometres (11,000,000,000,000 litres) of water flow into the delta. Approximately 60% is consumed through transpiration by plants, 36% by evaporation, 2% percolates into the aquifer system; and 2% flows into Lake Ngami. This turgid outflow means that the delta is unable to flush out the minerals carried by the river and is liable to become increasingly salty and uninhabitable, but this effect is reduced by the low salt content which collects around the roots of the plants. The low salinity of the water also means that the floods do not greatly enrich the floodplain with nutrients. The agglomeration of salt around plant roots means that many of the thousands of islands have barren white patches in their centre, which have become too salty to support plants, aside from the odd salt resistant palm tree. Trees and grasses grow in sand near the edges of the islands that has yet to become too salty. Approximately 70% of the islands began as termite mounds, where a tree then takes root on the mound of earth. Chief’s Island, the largest island in the delta, was formed by a fault line which uplifted an area over 70 km long and 15 km wide. Historically it was reserved as an exclusive hunting area for the chief. It now provides the core area for much of the resident wildlife when the waters rise. The Delta's profuse greenery is not the result of a tropical climate, rather it is an oasis in an arid country. The average annual rainfall is 450mm (approximately one third that of its Angolan catchment area) and most of it falls between December and March in the form of heavy afternoon thunderstorms. December to February are hot wet months with daytime temperatures as high as 40°C, warm nights, and humidity levels fluctuating between 50 and 80%. From March to May the temperature becomes far more comfortable with a maximum of 30°C during the day and mild to cool nights. The rains quickly dry up leading into the dry, cold winter months of June to August. Daytime temperatures at this time of year are mild to warm but the temperature begin to fall after sunset. Nights can be surprisingly cold in the Delta with temperatures barely above freezing. September to November sees the heat and atmospheric pressure build up once more as the dry season slides into the rainy season. October is the most challenging month for visitors - daytime temperatures often push past 40°C and the dryness is only occasionally broken by a sudden cloudburst. Species include African Bush Elephant, African Buffalo, Hippopotamus, Lechwe, Topi, Blue Wildebeest, Giraffe, Nile crocodile, Lion, Cheetah, Leopard, Brown Hyena, Spotted Hyena, Greater Kudu, Sable Antelope, Black Rhinoceros, White Rhinoceros, Plains Zebra, Warthog and Chacma Baboon. Notably the endangered African Wild Dog still survives within the Okavango Delta, exhibiting one of the richest pack densities in Africa. The delta also includes over 400 species of birds, including African Fish Eagle, Crested Crane, Lilac-breasted Roller, Hammerkop, Ostrich, and Sacred Ibis. The majority of the estimated 200,000 large mammals in and around the delta are not year-round residents. They leave with the summer rains to find renewed fields of grass to graze on and trees to browse, then make their way back as winter approaches. Large herds of buffalo and elephant total about 30,000 beasts. The Okavango Delta is home to 71 fish species including Tigerfish, Tilapia and Catfish. They range from 1.4 m Sharptooth-Catfish to 3.2 cm Sickle-fin Barb. The same species are to be found in the Zambezi River, indicating a historic link between the two river systems. The most populous large mammal is the lechwe antelope, with more than 60,000. It is a little larger than an impala with elongated hooves and a water repellent substance on their legs that enables rapid movement through knee deep water. They graze on aquatic plants and, like Waterbuck, take to water when threatened by predators. Only the males have horns. Papyrus and reed rafts make up a large part of the Okavango's vegetation. During the flood season they float well above the sandy river bed with roots dangling free in the water. This gap between bed and roots is utilised as shelter by crocodiles. The plants of the Delta play an important role in providing cohesion for the sand. The banks or levees of a river normally have a high mud content and this combines with the sand in the river’s load to continuously build up the river banks. In the Delta, because of the clean waters of the Okavango, there is almost no mud and the river’s load consists almost entirely of sand. The plants capture the sand, acting as the glue and making up for the lack of mud and in the process creating further islands on which more plants can take root. This process is important in the formation of linear islands. They are long and thin and often curved like a gently meandering river. The reason for that is that they are actually the natural banks of old river channels which over time have become blocked up by plant growth and sand deposition, resulting in the river changing course and the old river levees becoming islands. Due to the flatness of the Delta, and the large tonnage of sand flowing into it from the Okavango River, the floor of the delta is slowly but constantly rising. Where channels are today, islands will be tomorrow and then new channels may wash away these existing islands. The Botswana Okavango Game Lodges (2011) cater for small numbers of guests, each one operating in its own Okavango Delta private concession area. There are a huge number of lodges with low impact policies to the environment. The Okavango Delta peoples consist of five ethnic groups, each with its own ethnic identity and language. They are Hambukushu (also known as Mbukushu, Bukushu, Bukusu, Mabukuschu, Ghuva, Haghuva), Dceriku (Dxeriku, Diriku, Gciriku, Gceriku, Giriku, Niriku), Wayeyi (Bayei, Bayeyi, Yei), Bugakhwe (Kxoe, Khwe, Kwengo, Barakwena, G/anda) and ||anikhwe (Gxanekwe, //tanekwe, River Bushmen, Swamp Bushmen, G//ani, //ani, Xanekwe). The Hambukushu, Dceriku, and Wayeyi are all Bantus who have traditionally engaged in mixed economies of millet/sorghum agriculture; fishing, hunting, and the collection of wild plant foods; and pastoralism. The Bugakhwe and ||anikwhe are Bushmen who have traditionally practised fishing, hunting, and the collection of wild plant foods; Bugakhwe utilized both forest and riverine resources while the ||anikhwe mostly focused on riverine resources. The Hambukushu, Dceriku, and Bugakhwe are present along the Okavango River in Angola and in the Caprivi Strip of Namibia, and there are small numbers of Hambukushu and Bugakhwe in Zambia as well. 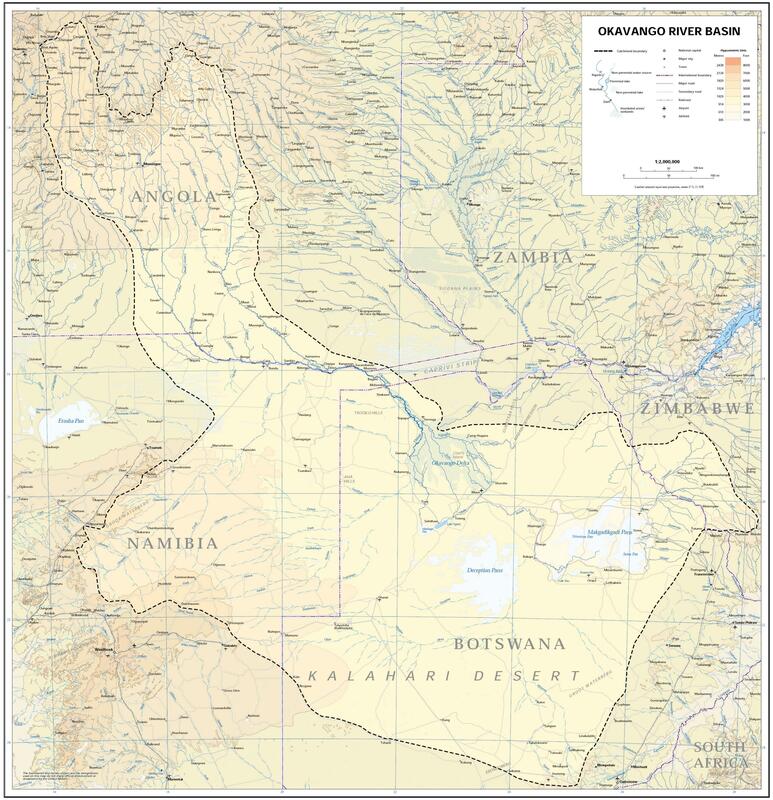 Within the Okavango Delta, over the past 150 years or so Hambukushu, Dceriku, and Bugakhwe have inhabited the Panhandle and the Magwegqana in the northeastern Delta. ||anikhwe have inhabited the Panhandle and the area along the Boro River through the Delta, as well as the area along the Boteti River. 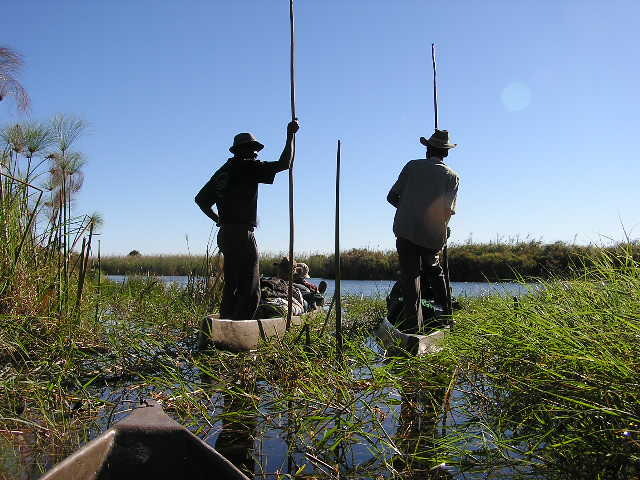 The Okavango Delta has been under the political control of the Batawana (a Tswana sub-tribe) since the late 18th century. Most Batawana, however, have traditionally lived on the edges of the Delta. 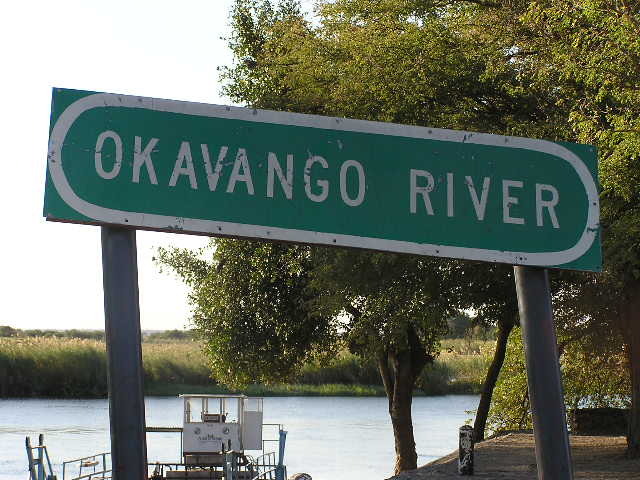 Small numbers of people from other ethnic groups such as Ovaherero and Ovambanderu now live in parts of the Okavango Delta, but since the majority of the members of those groups live elsewhere and the habitation is recent they are not considered as part of the Okavango Delta peoples. There are also several Bushmen groups represented by a handful of people. These groups were decimated by diseases of contact in the middle part of the 20th century, and most of the remaining members have intermarried with the ||anikwhe. 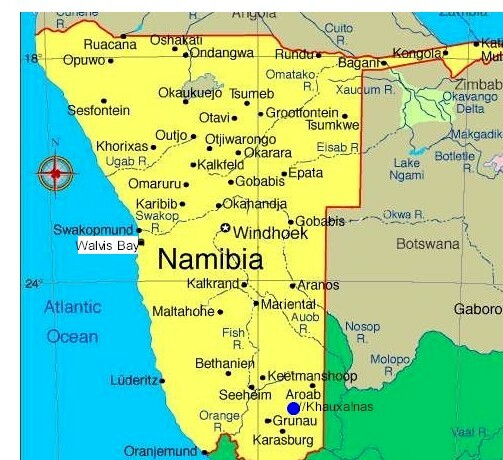 The Namibian government has presented plans to build a hydropower station in the Caprivi Region, which would regulate the Okavango's flow to some extent. While proponents argue that the effect would be minimal, environmentalists argue that this project could destroy most of the rich wildlife and plant life in the Delta.